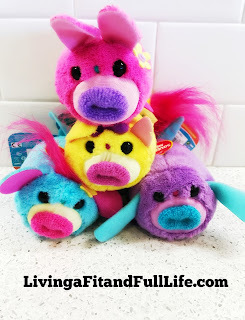 Living a Fit and Full Life: Have a Blast With Funrise's All New Sing-A-Ma-Lings Pets! Have a Blast With Funrise's All New Sing-A-Ma-Lings Pets! The Sing-A-Ma-Lings are a bunch of huggable goofy characters that have laugh-out-loud silly voices and get you singing! They can also harmonize with you and with each other. Just press their bellies to enjoy three ways to play: Sing, Jibber Jabber, and Harmonize! Collect them all! Bugle is an adorable beagle you can squeeze, and he’ll bark for you! Every time you give his tummy a squeeze, he’ll make funny puppy sounds or sing! Sound Plush, 3 button cell batteries included. Bonsai is a silly little monkey you can squeeze, and he’ll make monkey sounds for you! Every time you give his tummy a squeeze, he’ll go “ooo-ooo” or sing! Bunnaroo is a funny bunny you can squeeze, and she’ll squeak for you! Every time you give her tummy a squeeze, she’ll make cute little bunny sounds or sing! Sing-Butter is a super sweet kitten you can squeeze, and she’ll meow for you! Every time you give her tummy a squeeze, she’ll make silly meow-y sounds or sing! Have a blast with Funrise's all new Sing-A-Ma-Lings Pets! We love Sing-A-Ma-Lings in our house and always have. I still remember when we bought our first one at the store when my second was a baby. She literally cried at 4 months old because we put it back on the shelf. Probably needless to say, but we ended up getting it for her and a few others. As soon as Funrise's all new Sing-A-Ma-Lings Pets arrived my kids we elated with excitement! They all picked out there favorite and sat down together and played. Seeing all 4 of my kids play together is somewhat rare since my oldest is 9 and my youngest 2 but they honestly had a blast playing together. They actually still carry the Sing-A-Ma-Lings Pets around with them just about everywhere they go and they love the adorable little sounds they make. I love that they're small enough to go just about anywhere with the kids and are a great way for them all to play together. 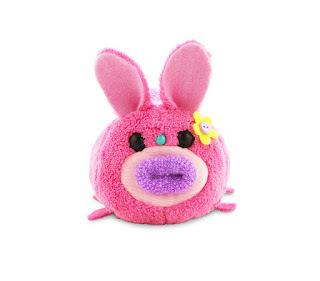 Funrise's all new Sing-A-Ma-Lings Pets are an absolute blast that kids of all ages will love! Click HERE to find a Toys''R''Us store near you! Click HERE to learn more about Sing-A-Ma-Lings ! Follow Sing-A-Ma-Lings/Funrise on social media!